Nintendo has just dropped a new, over thirty minute long Nintendo Direct talking exclusively about the much-awaited Mario Kart 8. Segments are dedicated to new items and tracks, in addition to details about the game's online multiplayer modes. 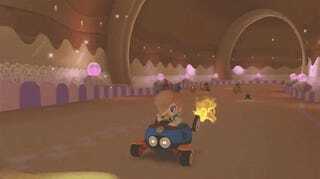 Two brand new characters are also revealed: heavyweight driver Pink Gold Peach, and lightweight driver Baby Rosalina. A new Mario Kart 8 Wii U bundle will also be released alongside the game on May 30. Priced at $330, it will include a Black Wii U Deluxe system, a red Wii Remote Plus and a red Wii Remote Wheel, along with the game itself. Nintendo is also running another promotion until July 31 where, by registering your freshly bought copy of Mario Kart 8 with Club Nintendo, you can grab one of four Wii U games for free: Wii Party U, Pikmin 3, The Legend of Zelda: Wind Waker HD, or New Super Mario Bros U.